NEW YORK (CNNMoney) -- Apple confirmed Tuesday that it will hold a press event on Oct. 4 at its Cupertino, Calif., headquarters. Expected to be the star attraction: The long-awaited iPhone 5. As always, the next-generation iPhone has been the subject of intense speculation. Almost daily, blogs and news agencies offer up new tidbits based on supposed leaks from hardware component makers or iPhone case designers to glean any information about what the next device could look like. The dominant rumors for the next iPhone involve an 8-megapixel camera, longer battery life, a faster processor and availability on the Sprint (S, Fortune 500) network. Others have claimed that the device will have a larger screen, a curved display, no home button, support for 4G networks, and more memory. In the past, about half the pre-launch rumors have turned out to be correct. Apple has typically unveiled its new iPhone at its Worldwide Developers Conference in June, but this year, Steve Jobs reserved that time to preview the company's new software, including the iPad and iPhone's iOS operating system, the new Mac OS X Lion operating system, and iCloud. In the fall, Apple (AAPL, Fortune 500) has traditionally updated its iPod lineup. Many analysts believe that the company will at the very least update its iPod Touch product this year, perhaps even selling a version with a 3G data connection. Despite the delays in launching a new version, demand for the iPhone 4 has remained insatiable. Apple sold a record 20 million of the devices in the second quarter, and early analysis points to another record quarter over the past three months. A recent RBC Capital survey suggested iPhone 5 sales would likely top those of the record-setting iPhone 4. 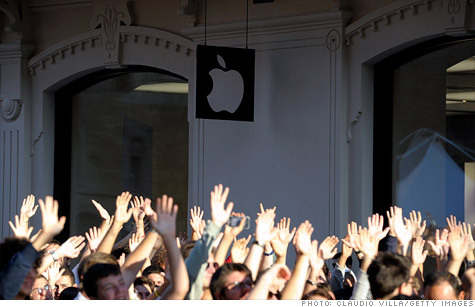 Apple's Oct. 4 event will likely be hosted by new CEO Tim Cook. Will there be a cameo from Steve Jobs, now Apple's chairman? Don't rule it out: Jobs has surprised audiences before, making two public appearances this year at Apple events during his medical leave of absence.